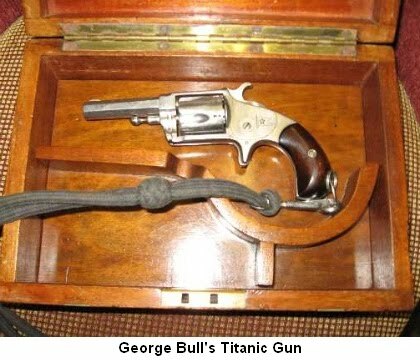 I have written previously about coincidences involving the Titanic - see links below - but today I'm writing about how the disaster may have never happened without the gun pictured below. In 1912 Britain was in the grip of a coal strike. This concerned Titanic's owners White Star Line as, without coal, their groundbreaking ship would not be able to set sail. White Star took proactive action and decided to send George Bull - mostly said to be a bursar or a purser for the company - to Merseyside along with a colleague R McPherson. Their mission was to secure coal for the Titanic - no matter what. George Bull was armed with the pistol as shown above. It is said that the men intimidated the striking miners while other reports say that they simply stole the coal at gun point. Either way the outcome was the same. They came away with sufficient coal to ensure that the Titanic would be able to set sail on time and with sufficient fuel for the journey. If it wasn't for this gun the Titanic would have been unable to sail when it did and would not, therefore, have hit the iceberg. Lives would not have been lost. The more you find out about the Titanic the more it seems to have been destined to sink. The gun in question was made by Hopkins & Allen in 1871, of Norwich, Connecticut, USA and is about to go on sale for £200,000 (around $320,000). There is bound to be a lot of interest as 2012 will see the Titanic's 100th anniversary of the sinking. The gun being sold comes with its original lanyard. There is a brass disc attached with the White Star Flag and on this is engraved 'RMS Titanic George Fredrick Bull', and on the reverse is printed 'If found contact Purchasing Dept. 14 Leadenhall St. London, EO3 Tel. Royal 9150'. So if you have a few hundred thousands to spare, and collect Titanic memorabilia, the people to contact are the Antiques Storehouse of Portsmouth, UK. Unfortunately the item does not appear to be on the Internet at the time of posting. ive got hooked on the titanic story recently. always finding out more and more. Never heard about this gun and the Titanic. Cool story. Even James Cameron missed this fact, right? Don't recall this gun in the movie. the main reason you have never heard about this gun is it is a fake being sold by mike lowery well known for selling fakes. My grandparents were wondering what to do with their recent windfall of an insurance payment of a crop being hailed out. My grandfather wanted to go to England to visit my grandmother's family and then come back first class on the Titantic. My grandmother said she never wanted to sail again, and vehemently disputed the claim the Titantic was unsinkable. They went to California instead. This sold for £9600 to a dealer. this gun and box was offered by mike lowery through the antiques storehouse several years ago at £100,000 since then it has been tampered with by the above to age it. £100,000 then sold for £9600 says it all. they are also well known for selling various fakes including white star line items and military items. buyers beware. Could someone say how they know this gun to be fake as I have been offered it? This gun was offered at an original price of £100,000 by the con man mike Lowery of Southampton. The box was never with the gun but put together to make it look more original. This was offered to several dealers and aged to look original. If you come across this gun or the idiot selling it fun a mile. Regarding the above, it was not a fake item to the best of my knowledge. The revolver had been sold prior by BONHAMS in 2005 and was reoffered untouched with the same description. We never knowingly sell copy/fake items. Andrew. Antiques Storehouse. This revolver was issued to George Frederick Bull in March 1912 by the White Star Line for his own protection whilst supervising the collection of black-leg coal from Wales to the White Star coaling yards at Birkenhead during the coal strike to enable RMS TITANIC to meet her April 10th sailing date. Bull was the Chief Clerk to White Star, responsible amongst other duties, for the arrival of the coal trains. A Cunard White Star brass fob on the case key is inscribed "Presented to Mr GF Bull after 47 years of service with the White Star Cunard Line Co. Ltd. by Sir Percy E Bates, Bart, GBE Chairman of the Cunard Steam Ship Co.Ltd." The dedication on the barrel was machine engraved for the presentation in 1946.